Well, new years mean new diets, right?? Of course they do! Everyone feels inclined to cleaning up their diet and getting themselves in shape and feeling better, especially after eating 42 cookies between Thanksgiving and Christmas, with a side of 863 pieces of chocolate that seem to multiply from Halloween. 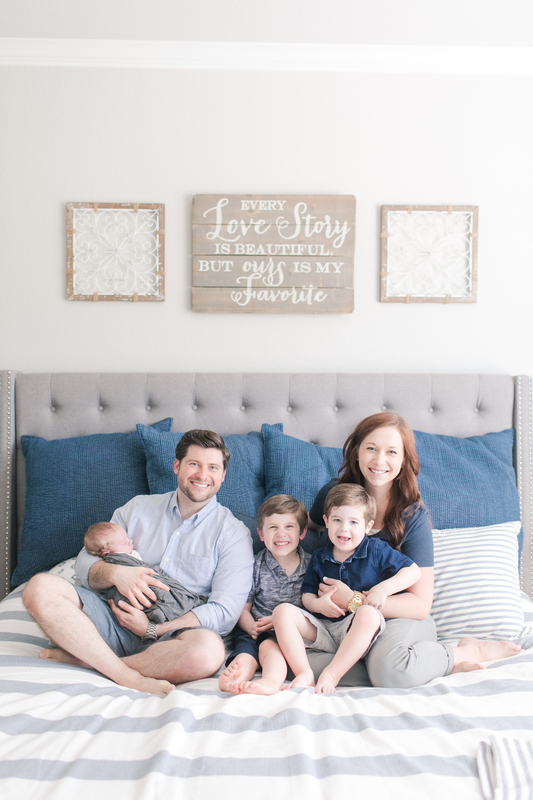 If you’ve been following my blog for any length of time, you’ve probably read about my birth stories, you know that my post partum recoveries have been rough. After my second son this year, I hemorrhaged, had two blood transfusions, and an extra long stay in the hospital. Ever since then I just haven’t felt like myself. I haven’t felt “good.” I’ve felt sluggish, tired, emotional, anxious… just not my normal contented self. So now that my son is almost 8 months old, I finally feel like I’ve gotten the hang of life again somewhat (haha do we ever really get the hang of life??) and am ready to do something drastic to help my body. My cousin’s wife recently was diagnosed with diabetes, and she is probably the healthiest person I know. She did a diet similar to Whole30 and it kept her condition from getting worse and has made it manageable for her without having to use medication. So I thought, hey, let’s give this a try. She and other friends of mine have done the Whole30 diet and just rave about how it has made them feel, how they have lost those extra pounds they had been trying to lose, and how their relationships with food have changed. I started reading “It Starts With Food” last month and and also recently got the Whole30 Guide and am really ready to do this. So here we go. From everything I have read and been told, preparation and planning is KEY. I have been reading on the Whole 30 website and also pinning recipes (you can follow my Pinterest Whole30 board here), trying to get a good plan in place. I thought it would be good to blog about it as much as I can so that I can focus my mind on the plan but also help others get started and make it through as well. I’m hoping to do future posts on meal plans and how I’m feeling throughout the next month. I copied the following directly from the Whole 30 website, because I couldn’t say it better myself, and because they need to have the recognition for this material. This is WHY I want to commit to this massive change in diet, at least for 30 days, if not longer in some aspects. The more I read about this diet and lifestyle change, the more enamored I am and interested in pursuing it. 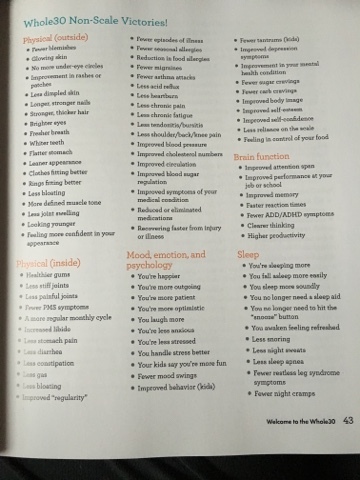 I feel like it will be an answer to some of the health challenges I’ve been dealing with. My body needs a “reset.” I need to break these habits I have had for so many years and just be kinder to myself instead of giving into muffin cravings every afternoon when the kids are asleep. (I may or may not have done that for a solid month and half… #momconfessions) I also feel like it will just be a good thing to do for the body that God has given me and also good for my family, because I am the one in charge of feeding them hah! 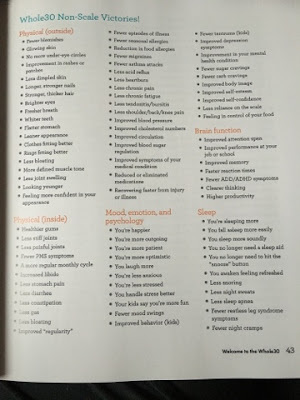 I listed some of the benefits of Whole30 below and also a couple of photos from their book. See links to success stories and testimonials here! These are so encouraging to read! 1. What can I eat? Eat whole foods of meat, seafood, eggs, vegetables, fruit, good fats from fruits, oils, nuts and seeds. Eat foods with very few ingredients, all ingredients you can pronounce or foods without ingredients involved because they are natural and unprocessed. 2. What I won’t eat. No added sugar of any kind, real or artificial – so no honey, maple syrup, agave nectar, coconut sugar, splenda, equal, stevia etc. 3. No Scales or Tape Measurers Allowed! A big part of this change in lifestyle is recreating your psychological relationship with food and improving your self image. You want to reduce your dependency on foods (comfort foods etc.) and learn to love the way you feel and look again without a number telling you to do so. 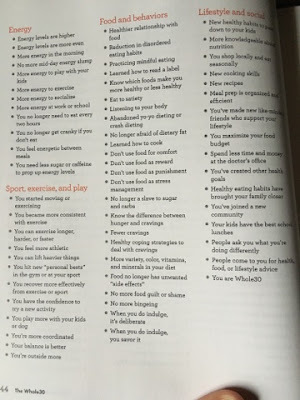 I really encourage you to read more on their website about “giving them 30 days” and how “it’s for your own good.” I copied a few excerpts below but I really would suggest reading through all of their information on their site if this seems like something you would be interested in. It is really empowering and makes you feel like you can make this commitment and do it! I hope maybe this has given you something to consider or think about. It’d definitely a huge change and will be an adjustment. I’ll be honest, I am kind of nervous about committing, especially with two little ones and a crazy labradoodle reeking havoc in our house, but I am hopeful and will do my best! That’s all you can ask for! If I’m not perfect this time, then I will try again haha! My next post will be over preparation for the program and then hopefully I will be able to post about meal plans and how things are going with Jacob and I throughout the 30 days. Hope to see you back soon! 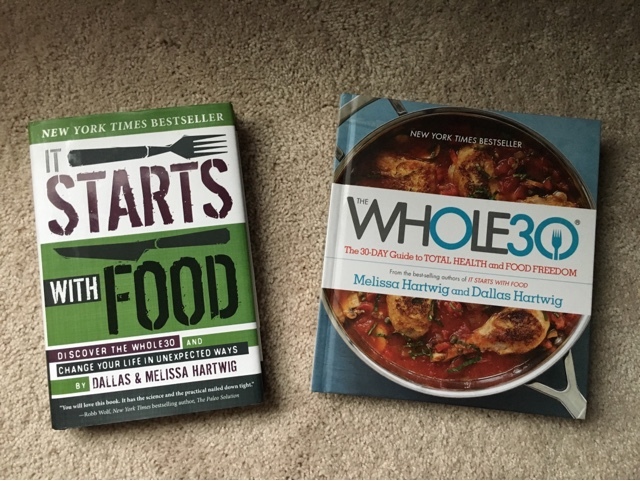 Next Whole30 – Getting Ready! I love the motivational excerpts from the book and am SO excited for you! Good luck! Keep us posted. I could never do this, but I know you can. 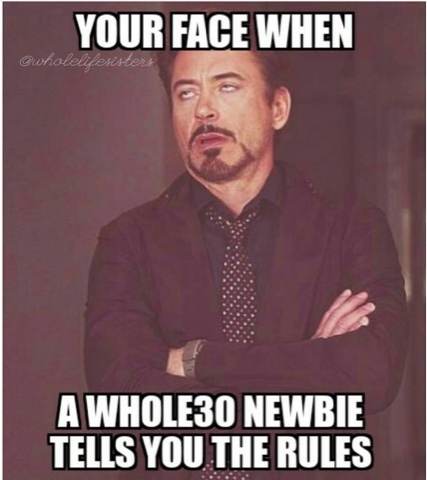 You had a VBAC- you can totally do a whole30!! 😉 I'll be cheering you on!